Antibody concentration after reconstitution 0.55 mg/ml. 1. Anti-NMDAR2A (GluN2A) (extracellular) Antibody (#AGC-002), (1:600). 2. 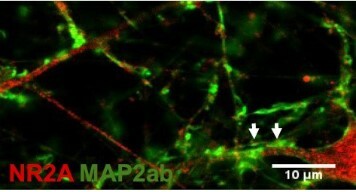 Anti-NMDAR2A (GluN2A) (extracellular) Antibody, preincubated with the control peptide antigen. 2. Cell lysates + protein A beads + Anti-NMDAR2A (GluN2A) (extracellular) Antibody (#AGC-002). 3. Cell lysates + protein A beads + pre-immune rabbit serum. Black arrow indicates the NR2A protein while the red arrow shows the IgG heavy chain. Immunoblot was performed with Anti-NMDAR2A (GluN2A) (extracellular) Antibody. Immunohistochemical staining of rat hippocampal dentate gyrus with Anti-NMDAR2A (GluN2A) (extracellular) Antibody (#AGC-002). 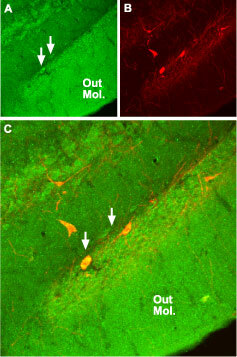 A. NMDAR2A (green) appears diffusely in the outer molecular layer of the dentate gyrus (Out Mol.) and in cells along the subgranular layer (arrows). 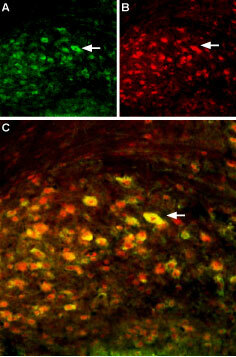 B. Staining of parvalbumin (PV, red) identifies interneurons in the dentate gyrus. C. Confocal merge demonstrates localization of PV in some neurons with NMDAR2A. Cell surface detection of NR2A in live intact rat C6 glioma cells. A. Cells were stained with Anti-NMDAR2A (GluN2A) (extracellular) Antibody (#AGC-002), (1:100), followed by goat anti-rabbit-AlexaFluor-555 secondary antibody (red). Cell nuclei were stained with the cell permeable dye Hoechst 33342 (blue staining). B. Live view of the same field. Expression of NR2A in human-induced pluripotent stem cell-derived neurons.Immunocytochemical staining of human-induced pluripotent stem cell-derived neurons using Anti-NMDAR2A (GluN2A) (extracellular) Antibody (#AGC-002). Adapted from Telezhkin, V. et al. (2016) Am. J. Physiol. 310, C250. with permission of The American Physiological Society. Anti-NMDAR2A (GluN2A) (extracellular) Antibody (#AGC-002) is a highly specific antibody directed against an epitope of the rat protein. The antibody can be used in western blot, immunoprecipitation, immunocytochemistry, and immunohistochemistry. The antibody recognizes an extracellular epitope and is thus ideal for detecting GluN2A in living cells. It has been designed to recognize GluN2A from rat, mouse, and human samples. Konstantoudaki, X. et al. (2016) Neuroscience 322, 333. Tindi, J.O. et al. (2015) J. Neurosci. 35, 8986. Atkin, G. et al. (2015) J. Neurosci. 35, 6165. Dupuis, J.P. et al. (2014) EMBO J. 33, 842. Rat hippocampal primary neurons (1:500). Mikasova, L. et al. (2012) Brain 135, 1606. Rocchio, F. et al. (2019) Cell Death Dis. 10, 24. Sibarov, D.A. et al. (2017) Front. Cell. Neurosci. 11, 155. Human induced pluripotent stem cells (1:300). Telezhkin, V. et al. (2016) Am. J. Physiol. 310, C250. Rat cultured hippocampal neurons (1:100). Swanger, S.A. et al. (2013) J. Neurosci. 33, 8898. Papouin, T. et al. (2012) Cell 150, 633.